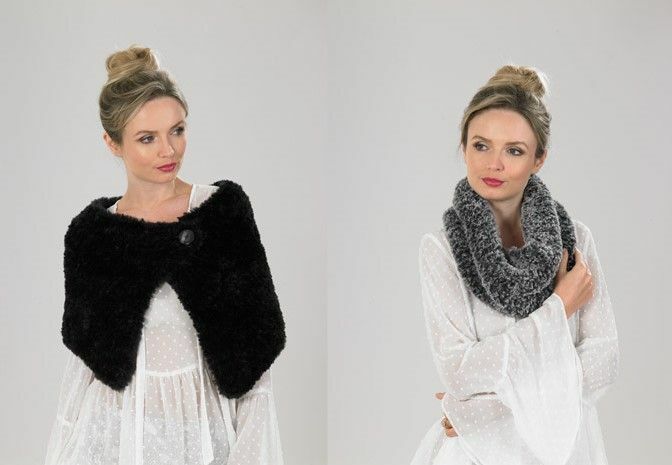 Knitting pattern for a Headband, Cowl, Shoulder Cover and Cape in James C Brett Chinchilla, a beautifully soft fur yarn in super chunky thickness, using 10mm needles making designs quick to knit. Headband - one size = Chinchilla CH03 x 1 ball. Cowl - 36 x 73cm = Chinchilla CH05 x 2 balls. Shoulder Cover - 124cm = Chinchilla CH03 x 3 balls. Cape - 118cm = Chinchilla CH06 x 3 balls.